Through-Wall Flashing Gets an Update (and Upgrade) | Masonry Technology, Inc.
Through-wall flashing is a pain. Save materials, drain better, and build a stronger wall with MTI's slope-to-drain tool and Cavity Weep. To address moisture concerns in single-wythe CMU walls most masons use a through-wall flashing approach. Through-wall flashing is time-consuming, requires multiple block widths - which may have inconsistent colors, creates a poor flexural bond (because the bed joint of mortar is laid on top of the peel and stick flashing) and is susceptible to concave surfaces which won't drain. Through-wall flashing is an old school approach that takes a lot of work - but doesn't work all that well. 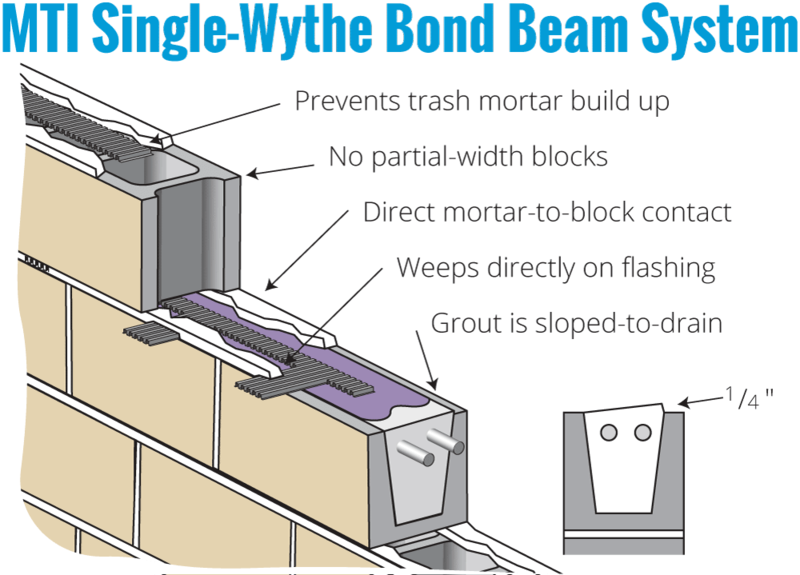 The MTI Slope-To-Drain tool creates a 1/4" per foot slope to drain on the bond-beam grout. The peel and stick flashing is installed on the grout, with space left on the edges for the bed joint of mortar. Roll out MTI Cavity Weep on the flashing, and then lay the bed joint of mortar and a the next row of block. Score and snap off the Cavity Weep, and then tool the joint for a finished look. Compared to through-wall flashing, MTI's approach drains better, creates a stronger wall (with direct mortar to block contact), uses fewer materials, and saves time. Partner with MTI to build better masonry walls, and read below to see the savings on a 100’ length of bond beam. compared with traditional through-wall flashing. MTI’s Cavity Weep system works better and saves you money. Save Money and Build Better with MTI.